A tropical party in a cup, festivitea is colorful and tasty. 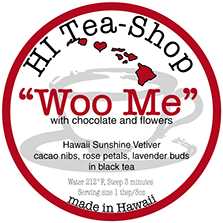 Papaya, tiny pineapple and mango pieces, and rose petals join Hawaiian Sunshine Vetiver in a sedate rooibos dance. When the dance is done, we all fall...asleep. Green rooibos hosts Vetiver and the juicy citruses: orange, lemon and lemon grass. This noncaffeinated elixir is subtle and simply relaxing. It'll take you gently by the head and lead you to sleep. 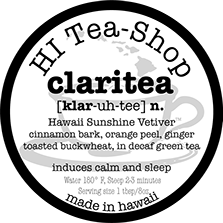 A decaf green orange ginger spice tea, claritea brings a smile to your lips even before you take your first sip. Refreshing cold and soothing hot, it's bold enough to survive several washings and snoozes! 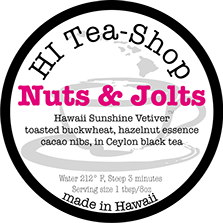 Hazelnut and cacao grounded in Hawaiian Sunshine Vetiver and Ceylon black tea. Although Nuts & Jolts is unapologetically decadent, it declines to gather around our waist or thighs. For such small favors we are grateful. Recommended pairing: Vetiver Esencia sugar, $7.50 with this tea. If true love begins with loving yourself, perhaps courtship begins the same way! This rich chocolate and flowers dessert blend is truly our most indulgent. Hot or cold, this tea will delight you and your guests. Its caffeine load should facilitate conversation and antics into the wee hours! 2014 Holiday blend! 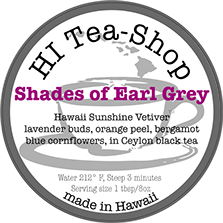 A pretty and tasty melange of Hawaiian Sunshine Vetiver, blood orange peel, lemon grass, lilikoi, peppermint, hiibiscus flowers, and rose hips in lovingly blended sencha and black teas. Deferring to the sencha, steep at 180 degrees. Infused Maui golden sugar!! Aromatic Vetiver Esencia, and floral, earthy Lavender Blossom. Enhance your tea or enjoy as a heady rim sugar on your cocktail glass!! $7.50 offer. 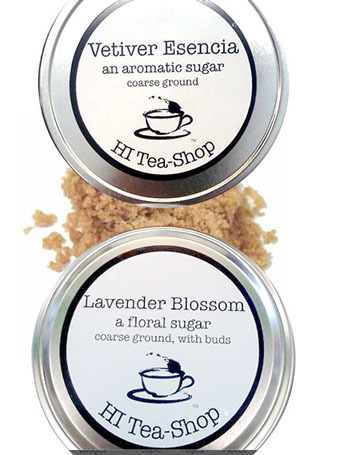 This sugar must join a tea item in your cart. Enjoy real or imagined life under the mango tree, sipping this juicy treat! 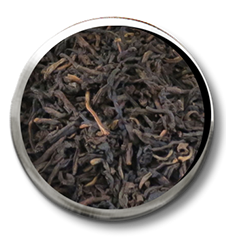 Unsweetened mango fractures and Hawaiian Sunshine Vetiver ensure tropical bliss in every sip of this Ceylon black tea! Find our products at Neiman Marcus, and other fine shops. 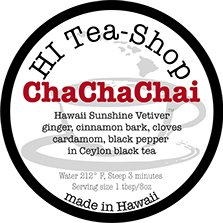 HI Tea-Shop is the whimsical child of Vetiver Systems Hawaii, LLC, which grows Hawaii Sunshine Vetiver to stabilize slopes and stop erosion. Mary Wilkowski is the visionary owner of both businesses. In 1997 she became a passionate advocate of the plant after falling in love with its fragrance and employing it extensively in her line of luxe Pele's Bath soaps. She's since earned the local moniker "the Vetiver lady." Always a fragrance aficionado, Mary started blending Vetiver with teas and aromatics in 2011. Within a year she had developed and began marketing the HI Tea-Shop line. Vetiver is a non-invasive deeply-rooted clump grass uniquely suited to solve environmental problems. Cultivated for centuries for its aromatic and Ayurvedic medicinal properties, Vetiver is one of the two most important base notes in perfumery. Like patchouli, Vetiver firmly anchors otherwise ephemeral florals and elusive citruses in the fragrance pyramid. Vetiver roots adopt the characteristics of their host soils, which accounts for the differences among Vetiver essential oils. 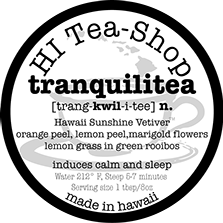 Hawaiian Sunshine Vetiver is potent, complex, sweet and earthy, which lends itself to culinary applications. 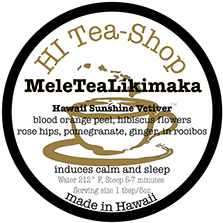 Hawaii Sunshine Vetiver is the brand of Vetiver Systems Hawaii LLC, which certifies that its Vetiver is noninvasive, non-competitive, and infertile.